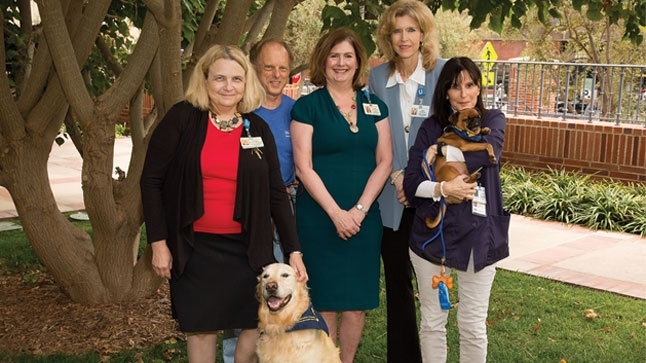 From left to right: Jeannie Meyer, Rodger Thomason and dog Logan, Elaine Eastwood, Carey McCarthy, Judith Bin-Nun and dog Shepzel. In 2014, UCLA’s departments of palliative care, spiritual care, social work and volunteer services worked together to create the No One Dies Alone (NODA) program. Two years after its launch, the program’s collaborative origins have served as the foundation of its continual growth and expansion. NODA volunteers sit at the patient’s bedside and provide compassionate, non-judgmental support and companionship to patients who are nearing death and have no loved ones available to be with them. Depending on the patient’s wishes, volunteers can hold the patient’s hand, sing, read, offer People-Animal Connection dog support (NODA-PAC) or meditate with the patient. “It’s wonderful that we can give our patients a little source of comfort: knowing that they are not alone,” says Elaine Eastwood, manager of volunteer services at UCLA Medical Center, Santa Monica. “It can also provide relief for nursing staff and for patients’ family members who spend a substantial amount of time at the bedside, but maybe need to take a break,” says Eastwood, referring to NODA-Respite. The passion and dedication of volunteers is also a key component of the program’s success. All volunteers attend rigorous training to understand death and the dying process, and how to be present with a patient. Marilyn Judson, a volunteer with NODA-PAC, views the time she spends with patients and families as a great privilege. “It’s eye-opening to be with someone as they approach the end of their life; it just stops you short and helps you appreciate life,” says Judson.